It is never too early to prepare for the winter hunting season. Summer time is the perfect opportunity to look over your gear and make sure everything is in order. It is also the perfect time to check out your personal gear to make sure that you can keep warm hunting this year. There are two essential items that you need if you are going to do any type of hunting, ice fishing or winter sports this season. The ICEBREAKER® BOOT BLANKET® insulated over-boots, and the ICEBREAKER® HANBLANKET® insulated hand muff. 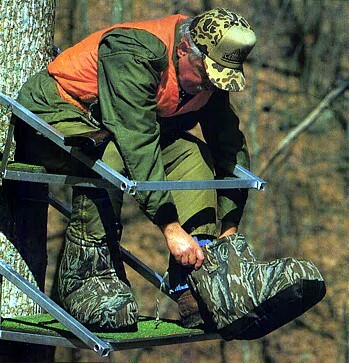 To keep warm hunting, you need to protect your extremities from the cold. The cold will affect the hands and feet before it impacts other areas of the body. By making sure that you keep these areas protected from the weather, you will guarantee that you will keep warm hunting and have a successful season. Nothing could be worse than having the perfect shot and not being able to make it because your hands were too cold to work, or your feet were too cold to move. The ICEBREAKER® BOOT BLANKET® offers two layers of insulation between the outer layer of the boot and the nylon, water-resistant interior layer of the boot. These boot blankets slip on easily over you standard shoes or boots and clinch at the top with a drawstring to ensure that the cold and snow stays out of the foot area. Your hands will stay warm with the ICEBREAKER® insulated hand muff. Constructed of the same durable material and insulation as the boot blankets, these hand muffs have elastic openings on each end that trap the heat around your hands so that you can keep warm hunting or enjoying any other winter activity. The hand muff construction keeps them virtually noiseless, making them perfect for those long bouts of sitting and waiting quietly while hunting. Every outdoorsman understands the importance of maintaining their equipment and the need to keep warm. By preparing early for the season, you will have no problem enduring the weather and will be able to keep warm hunting.